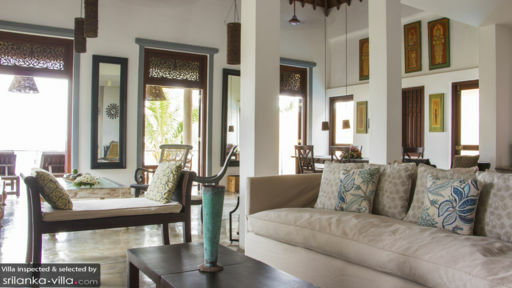 Villa Saldana is a beachfront vacation residence that embodies Dutch colonial architecture and period luxury. Areas are elaborately appointed with mostly antique pieces and, at once, amenities are contrastingly in-vogue – to assure your absolute comfort and diversion. 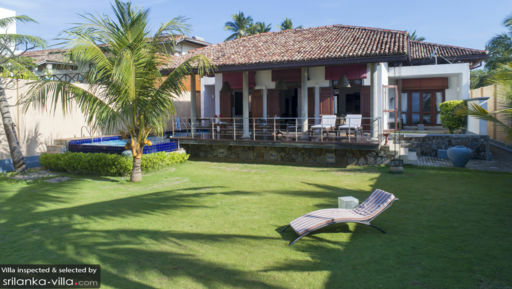 Truly, Villa Saldana accords you ancestral vacation living amidst a breezy, coastal air. The villa’s two air-conditioned master bedrooms are on both ends of the common area. One of these has direct access to the swimming pool, and the other leads out to the villa’s well-appointed covered terrace. The villa also has one air-conditioned guest room. Each bedroom is connected to a bathroom. Alongside the villa – extending to the exterior’s well cared for lawn – is the swimming pool. From one of the bedrooms and the common area, you can directly dip into its crystal-clear waters. Then, simply chill on the covered terrace at the near end of the swimming pool as you gaze out to the open sea. On three corners of the common area are different living area seating arrangements. The fourth corner is devoted to the dining area. The villa’s appetizing cuisine is concocted by an in-house chef at a well-equipped, modern kitchen as well as at a traditional curry kitchen. Addressing almost all you ask about and ask for – aside from administering the basic services – is the villa’s affable staff. 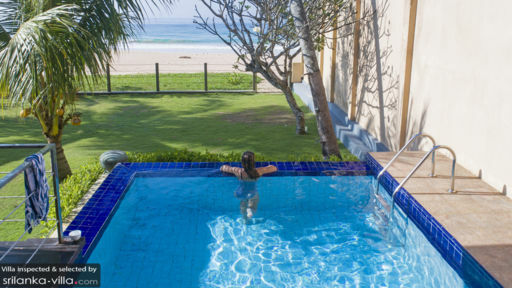 At Villa Saldana, along pristine Habaraduwa Beach, you can – right out front – enjoy ideal swimming conditions especially between the months of December to April. Close to the villa is the historical city of Galle – once a 16th century Dutch Fort – now a UNESCO World Heritage Site. The city is a jump off point to go-to villages, temples, rainforests, mines and plantations.